Gerald Edward Roberts Smith (1883-1959) - Stained glass designer. Born in Dorset and educated at Chester Arts School. Smith joined A. K. Nicholson's studio in 1906, and succeeded Nicholson in 1937 on his death, and ran the company as A. K. Nicholson Studios until his death in 1959. He was an early member of the British Society of Master Glass Painters, and Chairman from 1958-59. He had trained under Edward Frampton (1850-1929) who had himself trained with Clayton & Bell. 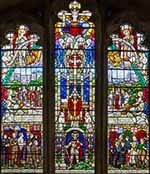 There is a memorial window to GER Smith, one of his own designs, in All Saints, Chalfont St. Peter, where Gerald Smith worshipped for many years, donated by his wife, friends and fellow craftsmen.